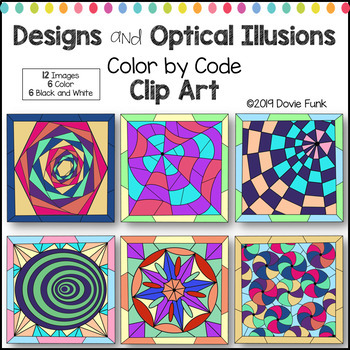 This resource includes twelve Designs and Optical Illusions color by code clip art images ready for you to create something wonderful! Solve and Color, Color by Number, Color by Sight Word ....... The possibilities are ENDLESS! There are six color images and six black and white. Black and white images have a clear background. PLEASE NOTE: This clip art is NOT included in the Summer Mystery Color by Code Bundle.